Tonight's dinner feature is a pan roasted Mahi Mahi, served with a wild rice pilaf, sautéed local green & yellow beans with a lemon tarragon compound butter. Suggested wine pairing, Malivoire Pinot Gris. Tonight we will be launching our new cocktail menu, so come down to the club and try one of the delicious new cocktails created by Gillian. Our feature beer this week comes from Beau's, and is the first of their farm table series, the Helles. It is brewed in the style of a traditional Bavarian blonde lager and is a perfect refresher for the tail end of summer. Next on tap will be Broadhead Brewing's Wildcard pale ale, a carefully hopped, refreshing pale ale. Watch this space for more details on our fall & winter dinner series for 2014-2015. Starting in October we will be hosting a unique tasting dinner one Saturday a month. Seating will be limited for these special dinners. With the arrival of September, Gas Dock hours will be 0900h - 1700h, seven days a week. Brad Strawbridge, our indefatigable yard steward will be manning the Gas Dock from Monday to Friday. As a result of Brad's other duties, he does get called away from the Gas Dock periodically, please be patient and he will do his best to be back as soon as possible. Weekend Gas Dock service will continue as normal. 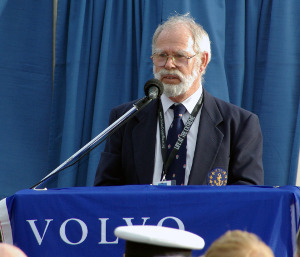 We would like to aknowledge KYC's very own Tim Irwin for being awarded the Volvo Cars Volunteer of the Month for August. Tim's hard work and dedication to KYC (Past Commodore 02-03) and CORK have helped promote the sport of Sailing here in Kingston and in Canada. Click below for the full write-up. Yoga at KYC with Norah Greatrix! We are proud to announce that we will be extending our August Yoga program for September! Where: September classes will be held at the club in The Partridge Room Located on the second level. 1545h, every Monday, classes formally start at 1600h. Mat, comfortable clothes & H2O. On Sept 12, the Carruthers Series consists of a small number of short races. This is always fun! For Sept 19, we are planning an Able Sail (fundraiser) Pursuit Race, starting near Collins Bay Marina and finishing at KYC. There will be evening festivities and an awards ceremony. On Sept 26, we have our KYC Chase Race to close out racing for the year. Unfortunately, Karl Poldre, our Race Management Coordinator has recently been lured away to a full time job in Toronto, starting Sept 1. Karl provided excellent service to KYC and we will miss him. However, it's a great opportunity for Karl and we wish him well! Until we find a replacement, we will be providing a volunteer Orange Peel driver to help the volunteer RC crews. If you can volunteer as a driver for some races during September, please email ken.martin@kingstonyachtclub.ca. Training can be provided. Continue to send your racing-related emails to race@kingstonyachtclub.com, where they will be processed. Some patience will be required regarding processing of results and their posting for the next while. KYC is building a team to race in 1 D Sailing Cup in late September in Bronte Harbour. There's $1,000 in prize money. For more details, check out https://1dsailing.com/1dsailingcup/.If you are interested in participating please contact John Curtis at john@windathletes.ca. You may have noticed that the Able Sail program was extremely active this summer. 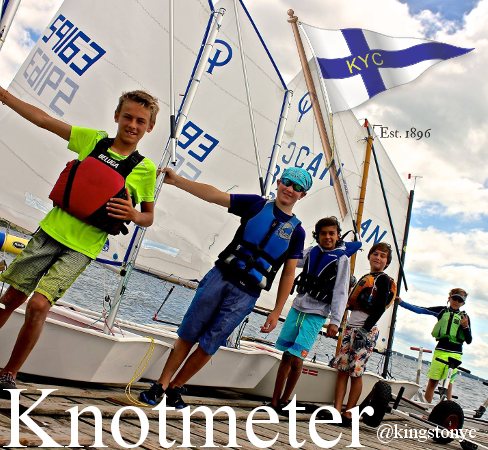 We want to express thanks to everyone at KYC for their support, to Ira and Akash especially for their fantastic work, and to Ron Watts for his generous donation of the Sonar, Zest. -A group of blind teenagers from CNIB who can sail as a team. -Elderly individuals who are lifetime sailors but have had to give up because of accessibility; in particular, think what it means for someone with Alzeimer’s who may have lost many memories, but who when handed a tiller is back in his element. -Many individuals for whom single-handed sailing is not suitable: those who require a professional attendant, those who are recovering from stroke and would like to sail with a supportive spouse, or those who just value the camaraderie of sailing with others. Our program is growing almost faster than we can keep up, and we have set our course on a major fundraising campaign to ensure that next year we have the resources to meet this need and take more people sailing. To do so we need to hire an additional instructor and to purchase a support boat to manage all the boats on the water at once. Please help by coming out to the annual event, which this year for the first time has been moved to KYC from Loyalist Cove Marina, where it has been generously hosted for the past several years. August was a busy month for Sharks who raced both the Canadian Championships and the Worlds Championships both in the same month. Three KYC boats packed up and drove down the road to Brockville Yacht Club to Represent KYC at the Shark Canadian Championships. Cariad, Shadfly and Jonathan Livingston Seagull all placed well while dodging Ocean Ships and fighting strong currents of the St. Lawrence River. 7 Races were sailed and Cariad placed 10th over all followed by Shadfly placing 5th and Jonathan Livingston Seagull placing 2nd out of a 31 boat fleet. Congrats to the all three boats on sailing well! Next for the Sharks in the same month was The Shark World Championship sailed in Britannia Yacht Club…Ottawa. This regatta too was well represented by three of our Sharks…VooDoo, Shadfly and Jonathan Livingston Seagull….and John Vines who helped with RC. These Shark Worlds were the 50th Shark Worlds Championships. Not to many fleets can boast that! The regatta was held over one week of sailing. Ten Races were scheduled including a Long Distance Race. We also sailed a Practice race which counts for the Metzger Trophy but does not count for the over all results. The sailing was trying which we all knew going into the regatta. Our KYC Boats showed great results with Shadfly winning the Long Distance Race which is a fantastic accomplishment against the big boat fleet. (If I am not mistaken…KYC Boats have won this trophy in 2011, 2012, (2013 was in Europe) 2014 and 2015. Great work keeping the Trophy in Kingston again! Jonathan Livingston Seagull also won the Metzger Trophy having the best three race finishes in the Practice, Long Distance and Last Race of the regatta. After 10 races, Shadfly finished in 4th and Jonathan Livingston Seagull in 3rd. VooDoo also finished with some good placings. We all had great fun and a good week of sailing. Peter Van Rossem, Kingston Shark Fleet Captain.